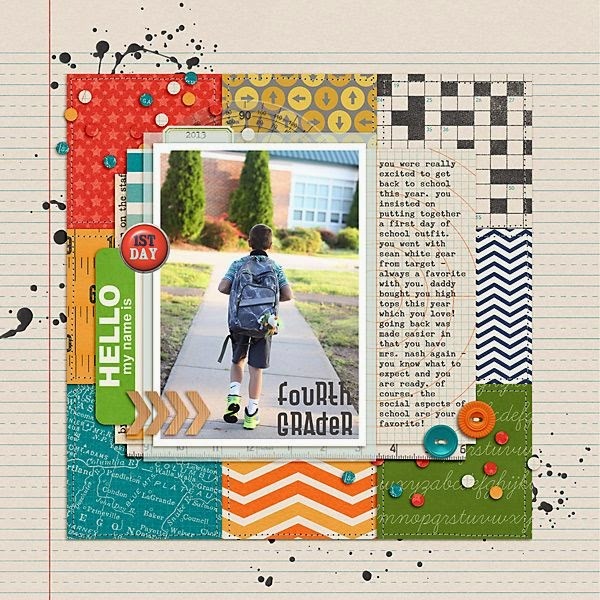 On this week's podcast, Tiffany and I challenged ourselves to scraplift two of the same layouts. I have a lot to say about how much fun I had scraplifting and some a-ha moments I had but I plan to share those on an upcoming podcast. Earlier this week, I shared my first scraplift...this is the second. See Tiffany's version here! For our second lift, we chose a layout by Celeste Smith. I have admired her simple style for years. When we chose it, I immediately thought to myself that I would use a 5x7. I try to keep a list in my head of some important stories I want to tell about things that are happening now. Something huge in our life is that Caroline has changed so much in the last year, especially the last six months. 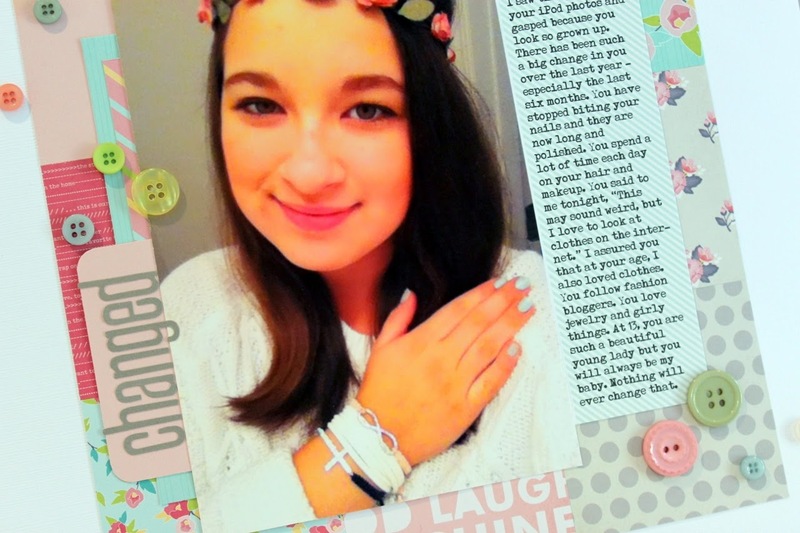 She is obsessed with fashion, jewelry, makeup and all things girly. So I felt like that needed to be documented. I didn't have a recent picture of her as a 5x7 so I chose a selfie from her iPod, knowing that it wouldn't be great quality. I printed it at home and it printed a bit dark (I might replace it with a better copy from Snapfish at some point). I really don't mind the quality of the photo. Lately I even kind of like a grainy photo because it reminds me it's a selfie and I love selfies. I used a Dear Lizzy 6x6 paper pad for the 3x3 squares so I wouldn't have to cut up 8 large pieces of paper. Tiffany told me she did that and I was so thankful for the idea! As you can see, the picture is on the dark side but I don't mind. It came out pretty good for an enlarged selfie! I'm just amazed by how grown-up she looks in it. She'll be 14 in 3 months. This would just be another page with a pretty picture except for this story. I tried to really write from the heart. I used a smattering of buttons to give movement and replicate the splatters on the original. I don't do splatters. I love buttons! For the title, I used some skinny Jillibean Soup alpha sticker letters that I LOOOOVVVVEEE. They always fit just right. I hope you enjoying seeing this! I'm having so much fun being scrappy! Hope you are too! See you Monday to share a new podcast all about "Overcoming Hurdles." It's a good one! Tracie, this is wonderful. I love everything about it! Tracie, this is so pretty!!! I love the papers you chose to use. It is such a great period in her life that you documented. Brit will be 16 in a few weeks. She has her own Pinterest acct. and has all kinds of hair, nails and fashion pins. Thank you so much Lisa and Michelle! Love the layout, and I think that pic of CC is great. Maybe it's the expression or her head tilt, but it really feels like her. It's hilarious that we both used a similar color scheme, especially since soft florals aren't my usual style. 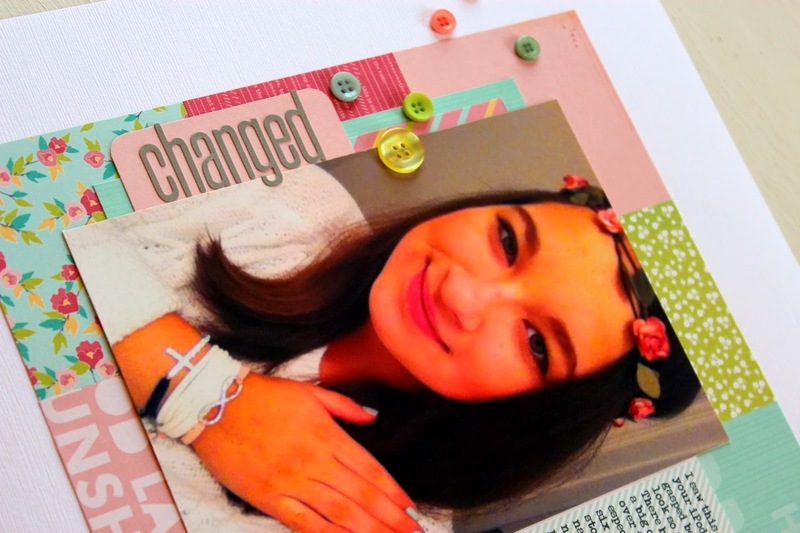 You're rocking the scrap lift challenge, girl! Love this and that photo is awesome! Fun layout, I'm going to try my hand at this one. On spring break this week and hope to do some crafting! i was searching on something else and this came up! thanks for lifting me!